1. School of Chemistry, Tel Aviv University, Tel Aviv, Israel. 2. Israel Plant Protection and Inspection Services, Beit Dagan, Israel. 3. Aviv Analytical LTD, Tel Aviv, Israel. Pesticide analysis in agricultural products is an application area of growing importance which is usually addressed by GC-MS and LC-MS. However, pesticide analysis is confronted by the dominance of matrix interference which severely restricts the achievable limits of detection. As a result, several methods were developed and used for the reduction of matrix interference and the most widely used is MS-MS. While in LC-MS, MS-MS is practically a must in view of absence of libraries and consistent fragments in the mass spectra, in GC-MS the use of full scan possesses a few advantages of unambiguous library identification and its applicability to unlimited number of GC-MS amenable pesticides, provides however that the problem of matrix interference can be properly addressed. In addition to MS-MS at least three other techniques can be used to reduce matrix interference while enabling the use of full scan namely: a) high resolution mass spectrometry; b) GC-MS with Cold EI in which the enhanced molecular ions suppress matrix interference as described in another article in this blog. c) GCxGC-MS with its improved GC separation that can be used for the reduction of matrix interference as described in a few papers with thermal modulation and as discussed in this article. We developed Pulsed Flow Modulation (PFM) for obtaining GCxGC-MS with supersonic molecular beams (SMB) (also named Cold EI) based on a low cost single quadrupole mass analyzer and without any added cooling gas. For further information on the concept of Pulsed Flow Modulation GCxGC please read M. Poliak, M. Kochman and A. Amirav, "Pulsed Flow Modulation Comprehensive Two Dimensional Gas Chromatography" J. Chromatogr. A. 1186, 189-195 (2008) (also Israel patent number 176724 and USA patent number 7518103). In PFM-GCxGC-MS with Cold EI, sample compounds which elute from the first GC column are temporarily stored in a fused silica transfer line and are pulsed periodically injected by ~25 ml/min He gas pulse into the second column. After the pulse, ~20 ml/min He develops the chromatography in the second column for a few seconds (typically 4s). PFM is simple to construct, does not require any added gas with Cold EI and the injection time can be tuned, hence PFM-GCxGC-MS with Cold EI is enabled with quadrupole MS. The increased PFM second GC column flow rate is seamlessly handled by the Cold EI nozzle vacuum chamber. We combined PFM-GCxGC with the Aviv Analytical 5975-SMB GC-MS with Cold EI and analyzed with it twelve pesticides in two agricultural matrices. PFM-GCxGC-MS with Cold EI combines the improved separation of GCxGC with the features of Cold EI of enhanced molecular ions and isotope information for the provision of ultimate sample identification information. Unique to PFM-GCxGC-MS with Cold EI is that in contrast to thermal modulation with standard GC-MS the second dimension elution time does not suffer from any ion source peak tailing and/or second column saturation effects and thus it is ideally suitable for pesticide analysis in complex matrices. An estimated 2000 chemicals are being used as pesticides worldwide, including banned pesticides and other hazardous chemicals. In view of international food trade this large number implies that pesticide analysis should not be treated as a limited number of target compounds analysis. Furthermore, pesticides analysis is performed in complex agricultural products that severely impede the achievable limits of detection via extended matrix interference. As a result, the use of MS-MS is growing owing to its reduction of matrix interference. We estimate the MS-MS matrix interference reduction factor to be about 20 as discussed in our article on MS-MS Failure. However, MS-MS in both forms of GC-MS and LC-MS is limited to the analysis of only few hundred pre-selected (target) pesticides, the MS-MS method is rigid and the pesticides that are not included in its list are by definition the subject of false negative. Thus, there is growing need for a new method of pesticide analysis that will combine the MS-MS strength of matrix interference reduction with the features of full scan of usability for unlimited number of GC-MS amenable pesticides. This method should also preferably extend the range of pesticide amenable for GC-MS analysis to include some of LC-MS pesticides and enable improved trace pesticide identification via the NIST library (or other libraries) as well as allow for pesticide identity confirmation by an independent method. Finally, this new method should preferably be obtained with a low cost single quadrupole MS system. In order to meet the above mention challenges we developed pulsed flow modulation GCxGC-MS with Cold EI method and system for improved pesticide analysis as described in this article. 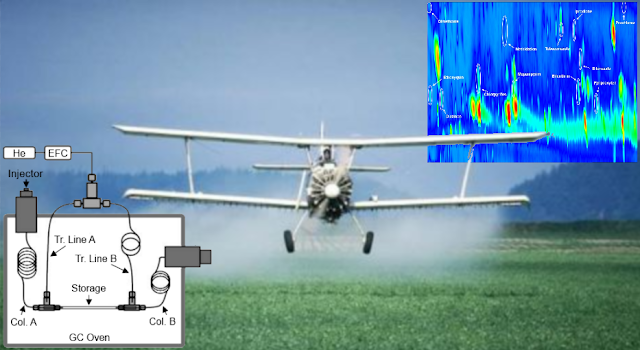 GC-MS with Cold EI (EI of Cold Molecules in Supersonic Molecular Beams (SMB) and fly-through ion source) was evaluated in the past with pesticide analysis in agricultural products as described in M. Kochman, A. Gordin, P. Goldshlag, S. J. Lehotay and A. Amirav "Fast, High Sensitivity, Multi-Pesticide Analysis of Complex Mixtures with the Supersonic GC-MS" J. Chromatogr. A. 974, 185-212 (2002). Recently, we further refined this pesticide analysis method while using the Aviv Analytical 5975-SMB GC-MS with Cold EI as described in our article on the subject. GC-MS with Cold EI provides enhanced molecular ions and it extends the range of pesticides amenable for analysis. Furthermore, the feature of enhanced molecular ions leads to improved selectivity and reduced matrix interference in comparison with lower mass fragments as described in the paper above and in another article in this blog. In this article we describe the further significant contribution of PFM-GCxGC to the reduction of matrix interference by an average factor of 32 while maintaining the use of full scan thereby obtaining universal pesticide analysis for unlimited number of pesticides. Pulsed Flow Modulation GCxGC (PFM-GCxGC) is described in details in references 1-3. Thus, it will be only briefly described here with reference to Figure 1 and the two photos in Figure 2. Figure 1 shows the Aviv Analytical Pulsed Flow Modulation GCxGC control software window that includes in its left side a schematic diagram of the pulsed flow modulation components. The main idea behind PFM-GCxGC is that by properly tuning flow directions and rates one can convert the continuous GC output gas flow rate from the first analytical column A into discrete gas pulses for their pulsed injection into the second GCxGC analytical column B. As shown in Figure 1 left side diagram, the sample compounds elute from column A into a storage transfer line (typically 50 cm 0.53 mm I.D. deactivated fused silica capillary) through a first T connector. The storage transfer line is connected to the second GCxGC analytical column B via a second T connector. Both T connectors are further connected via a first gas transfer line A and a second gas transfer line B respectively to a three-way solenoid valve that is controlled by the Aviv Analytical PFM operational software, which controls the direction of helium flow. At a given time after the storage transfer line is almost full (typically chosen to be 4 s), a pulse of about 0.3 seconds of typically 20 ml/min helium is directed by the solenoid valve into the first T connector, and the previously eluted sample compounds which were stored in the storage transfer line are quickly flushed into the second analytical column B while temporarily stopping the first analytical column A flow. After this short gas flow pulse, the three-way solenoid valve changes its direction for a few seconds (in our case 4 s), the flow in gas transfer line A stops while the flow in the second gas transfer line B commences at a lower flow rate such as 16 ml/min, since transfer line B has a higher flow impedance than transfer line A (The solenoid valve provides constant pressure). This relatively lower flow rate enables the elution and analysis of sample compounds in the second GCxGC analytical column B, while the sample which elutes from the first analytical column A, is stored in the storage transfer line. A main feature of the pulsed flow modulation is that the short, high flow rate pulse, which flushes the sample from the storage transfer line into the second analytical column B, also simultaneously stops the elution of sample compounds from the first analytical column A. The short high flow rate pulse creates a higher pressure at the first T connector, which not only stops the first analytical column flow, but could also slightly temporarily reverts the gas flow back into the column from its output end. An important feature of the PFM is that the ~20 times higher flow rate in the second GCxGC column B than in the analytical column A compresses in-time the sample compounds that are pulsed injected into the second column and the injection pulse width (in time) can be tuned. For example, when a cycle time of 4 s is used it is 4 s divided by the flow rate ratio of 20 which results in an injection pulse width of 200 msec. As a result, PFM-GCxGC can be coupled with quadrupole MS despite its limited scan speed. Two photos of the Aviv Analytical Pulsed Flow Modulation GCxGC are shown in Figure 2. The left side photo shows the electronic flow control and gas input and output box plus the three way gas valve that is mounted on top of the GC. This PFM box is computer controlled via the software whose GUI is shown in Figure 1. The right side photo shows the second GCxGC column mount plus the two Swagelok 1/16" T unions that are connected with a 0.53 mm ID deactivated fused silica storage tubing. The first GC column is shown at the rear of the GC oven. As shown, the PFM GCxGC modulator arrangement is simpler than thermal modulation GCxGC modulator and it does not require any cryogenic gas supply with its bulky CO2 cylinders or liquid nitrogen containers. Figure 1. Aviv Analytical's Pulsed Flow Modulation GCxGC control software window (GUI) with the method parameters that were used for the pesticide analysis. When not in method development this window is collapsed/minimized into a small window of readbacks. Click image to enlarge. Figure 2. Photos of the Aviv Analytical Pulsed Flow Modulation GCxGC. The left side photo shows the electronic flow control and gas input and output box (removed cover) plus three way valve that is mounted on top of the GC. The right side photo shows the second GCxGC column mount plus the two T unions that are connected with the 0.53 mm ID deactivated fused silica storage tubing. The first GC column is shown at the rear of the GC oven. An additional T union is shown, connected to an auxiliary EPC and is not a part of the PFM GCxGC. Click image to enlarge. In this section we outline the full range of experimental parameters used in the pesticides analysis by PFM-GCxGC-MS with Cold EI and explain some of the important considerations behind the selection of central parameters. System: Aviv Analytical 5975-SMB GC-MS with Cold EI system that is based on the combination of an Agilent 5975 MSD with the Aviv Analytical supersonic molecular beam interface and its unique fly-through ion source. A comparison study of the same samples was performed at the Israel Plant Protection center with a standard Agilent 5975 MSD system. Sample: 12 pesticides as listed in the tables below that were spiked in Baby leaves mixture extract and in Lettuce extract. Injection: 5 µL with pulsed splitless at 70 PSIG for 0.5 min at 220ºC injector temperature. 1st dimension analytical column: 15 m, 0.25 mm ID, 0.25µ film DB5ms-UI. 2nd dimension analytical column: 3 m, 0.32 mm ID, 0.25µ film Rxi-200. He first column flow rate: 0.8 ml/min. Pulsed Flow Modulation gas transfer lines: 70 cm 0.25 mm ID capillary transfer line to the second dimension column entry side and 50 cm 0.32 mm ID capillary transfer line to the storage capillary at its first analytical column exit side. Sample Storage Capillary: 50 cm of 0.53 mm ID deactivated transfer line by Agilent. Pulsed Flow Modulation helium flow rates: about 20 ml/min during the injection time and 16 ml/min during the second column separation cycle time. GC Oven Temperature Program: 100°C with 20°C/min to 150°C followed by 5°C/min to 260°C followed by 20°C/min to 300°C with waiting period of 6 min at 300°C for total run time of 31.5 min. 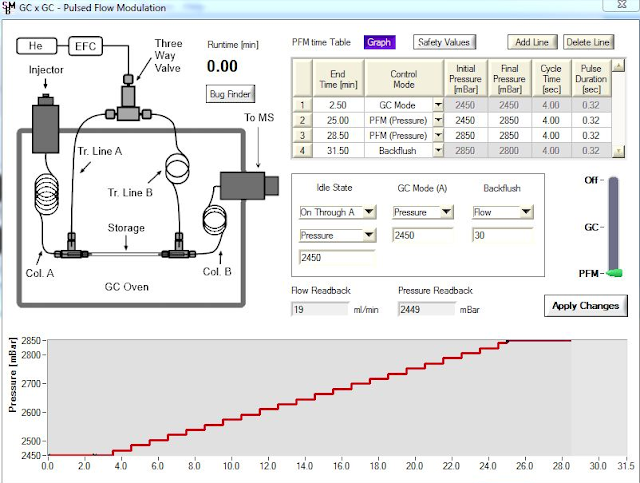 PFM Pressure Program: See above in the Aviv Analytical PFM-GCxGC screen. Backflush: Backflush was initiated after 28.5 min for 3 minutes via column A flow rate reduction to 0.2 ml/min and the increase of PFM flow rate to 30 ml/min (>30 PSIG). It resulted in about 3 ml/min backflush flow rate through the first column A and 27 ml/min through column B. Cold EI Fly-Through Ion Source: 10 mA emission, 70 eV electron energy, 62 ml/min total He makeup and PFM flow rates using 700 mBar nozzle backing pressure. The PFM gas requirement is offset by reduced nozzle make-up gas flow rate thus the PFM by itself does not add any gas requirement. SMB transfer-line temperature: 250ºC with temperature program of 5°C/min after 20 min to 280°C. 5975 mass spectrometer: 50-460 amu at 11.6 Hz scanning frequency (0 A/D samples). 5975 mass spectrometer tune change: The faster than usual scan speed introduced negative mass shift of about 0.17 amu that was corrected via the change in the manual tune screen of MASSOFFSET from -34 to -24 in the tune values. No other change was made in the tune. Electronic Pressure and Flow Controller: Aviv Analytical uses the Alicat MC200 EPC/EFC. GCxGC method development is known to be more involved than standard GC method development. However, once the PFM-GCxGC concept is understood its method development can be relatively simple to implement and optimize based on the following considerations. First Dimension GC Column. While the main target of PFM GCxGC-MS is the reduction of matrix interference we also wish to enable the use of the same set-up for extended range of pesticides amenable for analysis for the confirmation of LC-MS pesticides. Thus, we selected 0.25 mm ID column with only 15 m length which enables standard operation with 0.8 ml/min with some lower elution temperatures than with the standard 30 m column combined with up to 25 ml/min pulsed splitless injection flow rate at lower than usual injector temperatures. The use of shorter column further enables operation with up to 15 ml/min flow rate during chromatography thereby with lower elution temperatures of labile pesticides. The subject of extended range of compounds amenable for GC-MS analysis is described in another article in this blog. Naturally, if only GCxGC-MS is targeted one can use the standard 30 m columns. Second Dimension GC Column. In PFM-GCxGC it should be as long as possible for best separation and with minimal flow impedance under high column flow rate limits. However, it must enter into 0.53 mm ID storage transfer line hence 0.32 mm ID column is the most suitable. The second column sorption phase selection is the same as in thermal modulation GCxGC and the Restek Rtx-200 is a reasonable choice that induced pesticide separation that covered the full 4 s cycle time of the second GC dimension. Storage Capillary Length. This length selection depends on the choice of second dimension cycle time which is 4 s in our case and first dimension column flow rate which was 0.8 ml/min. In this case the eluting volume in 4s is 53 µL and the storage capillary should have volume bigger than that. For 0.53 mm ID transfer line capillary this means that its net length should be longer than 27 cm. We selected 50 cm to have freedom in the choice of flow rate and cycle time as some added length does not degrade the performance. Pulse Duration Time and its PFM-GCxGC Optimization. We selected, as shown in Figure 1, 0.32 s. The selection of injection pulse duration and second column flow rate is optimized via the use of a steady flux of pentane from a sampler. We used for PFM pulse width optimization a 1 ml syringe with a ChromatoProbe vial inside it that was loaded with pentane and inserted into the injector to serve as a diffusion source of steady flux of pentane. Aviv Analytical provides this syringe and vials with its PFM GCxGC kit. After ~1 minute 1st column transit time one can operate the MS with SIM on m/z=72 of pentane and see the effect of all the PFM parameters on the injection time and pulse shape and width on the Agilent Chemstation screen. The goal is to have injection time of about 200 ms which was obtained in our case with 2450 mBar absolute (~21 PSIG) and 0.32 sec injection pulse duration. The actually produced pulse width was faster than 0.32 s and was about 0.2s. PFM Gas Source Lines. In PFM-GCxGC the gas line that is connected into the first column side must be with smaller flow impedance than the second gas line so that when the flow is switched into it the pressure at the first column output will be increased and as a result the first column flow rate will be temporarily halted for the duration of the second dimension injection time of ~0.2 s. We found that the use of 0.32 mm ID capillary for the first column side and 0.25 mm ID capillary for the second dimension column side are adequate and we even further prolonged the 0.25 mm ID capillary length by about 20 cm. PFM Pressure Program. Similar to thermal modulation, as the GC oven temperature is increased the time spread in the second dimension column is increased and at some GC oven temperature there is a risk of having second dimension elution in the next cycle (known as wrap around). Thus, in order to prevent that adverse effect we used second column flow program via the second column head pressure program as described in the PFM software window shown in Figure 1. Accordingly, the pressure was gradually increased from constant 2450 mBar for 2.5 min, followed by linear pressure program up to 2850 mBar at 25 min and constant pressure of 2850 mBar up to 28.5 min. Between 28.5 min and 31.5 min backflush was operated with 30 ml/min. This pressure program worked very well to eliminate the wrap around problem. GC Oven Temperature Program. The GC oven temperature program is also important for the GCxGC-MS performance. For optimal first dimension separation the peak width should be longer than the second dimension cycle time and up to three second dimension cycles. As a result, the temperature program should be slow yet not too slow to provide sufficient analysis throughput. In addition, the GC program also affects the elution time spread in the second dimension. The slower the GC oven temperature program the lower are the sample compounds elution temperatures and thus the greater is their time spread in the second column elution. Thus, our compromise value was 5ºC/min during the pesticide elution time that resulted in full spread of the pesticide elution times in the second GC dimension combined with standard analysis time of 31.5 min. Backflush. In pesticide analysis in complex agricultural matrices, backflush is practically essential for two reasons: a) It help to keep the column inert and clean despite the high load of matrix that is deposited on it from the liner; b) It enables the injection of larger volumes of samples in complex matrices such as up to 5 µl splitless (5 mg matrix extract) while keeping the column in good condition despite the added matrix load on the column. As a result, up to x5 improved instrument sensitivity can be obtained. One of the advantages of PFM-GCxGC over thermal modulation GCxGC is that the PFM-GCXGC device can also serve as a built-in backflusher device since it includes a gas supply junction with electronic flow/pressure control behind the flow impedance of the second dimension GCxGC column. Thus, as shown in Figure 1, after 28.5 min the pressure program was switched into backflush mode with 30 ml/min which is about 3000 mBar and in addition, the Agilent 7890 GC injector pressure was reduced to 2 PSIG at that time. Backflush is a known effective technique to keep the first dimension column clean from low volatility compounds such as agricultural matrices compounds and in our experiments it fully proved its value. The injection of 5 µl splitless was enabled with standard liner at 70 PSIG since at these conditions the volume of vaporized acetone solvent is still smaller than the liner volume. 5975 Scan Speed. We used 10.6 Hz that as shown in the results below, is sufficient for the pesticide analysis with PFM-GCxGC-MS with Cold EI. For the mass spectral range of 50-460 amu this is a scanning rate of 4400 amu/s. The Agilent 5975 MSD is capable of using fast scan mode up to about 8000 amu/s. However, we found that when the fast scan mode is used, isotope abundance information is lost since the mass spectral resolution is deteriorated. Since we believe that GCxGC-MS is all about the provision of best sample identification information, we prefer to have somewhat slower than optimal scan speed than losing the ability to provide pesticide identification confirmation with our TAMI software for improved sample identification based on molecular ion isotopomers height ratio. We evaluated the Aviv Analytical PFM-GCxGC-MS with Cold EI in the analysis of twelve pesticides that were spiked at 100 ppb and at 25 ppb in Baby leaves mixture extract and in Lettuce extract. The Baby leaves mixture is considered as a "difficult matrix" while the Lettuce is an easier matrix. 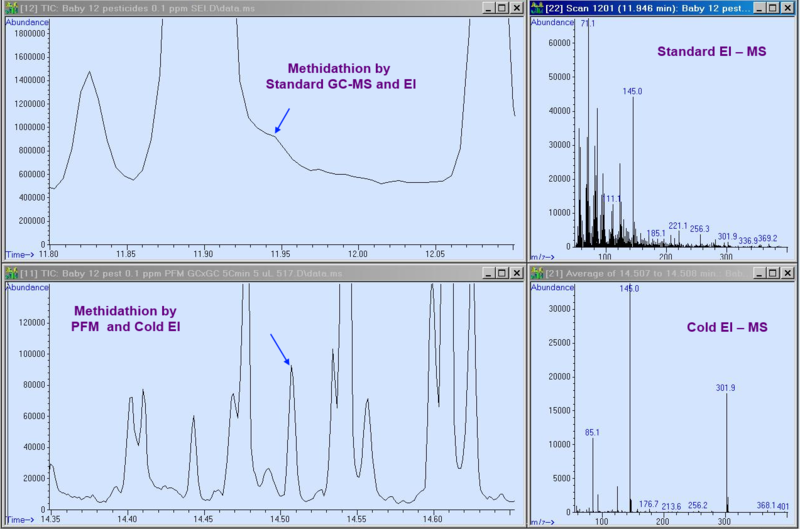 In Figure 3 below we show a comparison of pesticide analysis by standard Agilent 5975 GC-MS with its standard EI ion source (upper trace) and PFM-GCxGC-MS with Cold EI (bottom trace). 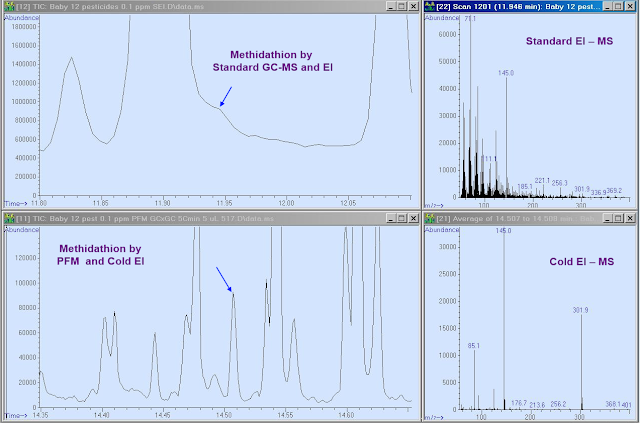 0.3 minutes sections of the total ion count mass chromatograms are shown in which 100 ppb Methidathion elutes at 11.94 min in standard EI and at 14.51 min in PFM-GCxGC-MS with Cold EI. As demonstrated the Methidathion pesticide is revealed in standard EI only as a small peak at the shoulder of a much higher matrix peak and both are superimposed on some matrix background. In sharp contrast, in PFM-GCxGC-MS with Cold EI the Methidathion is revealed as an almost clean narrow peak with little matrix interference. Furthermore, the Cold EI mass spectrum of Methidathion is characterized by significant enhancement of the molecular ion. Thus, the combination of enhanced molecular ion and largely reduced matrix interference results in "dramatic" improvement in PFM GCxGC-MS with Cold EI in both peak to matrix background ratio and in the quality of mass spectra that are far cleaner with PFM-GCxGC-MS with Cold EI. In order to have a quantitative measure of the magnitude of improvement that is obtained by the PFM-GCxGC in the reduction of matrix interference we need to establish a measurable factor of improvement. The best way that we found to quantify this improvement is by the ratio of pesticide peak to matrix background and thus the PFM improvement factor is the ratio of the pesticide peak to matrix in PFM-GCxGC-MS with Cold EI divided by the same ratio as obtained in GC-MS with standard EI. In PFM-GCxGC-MS with Cold EI the Methidathion/matrix ratio is 12.0 while in GC-MS with standard EI it is 0.077 and thus the PFM improvement factor is ~155. In fact, it is even higher than 155 since standard EI was operated with 30 m column while PFM-GCxGC-MS with Cold EI was operated with 15 m column thus with about x1.4 times less first dimension separation. Figure 3. A comparison of pesticide analysis by standard GC-MS with its standard EI (upper trace) and PFM-GCxGC-MS with Cold EI (bottom trace). 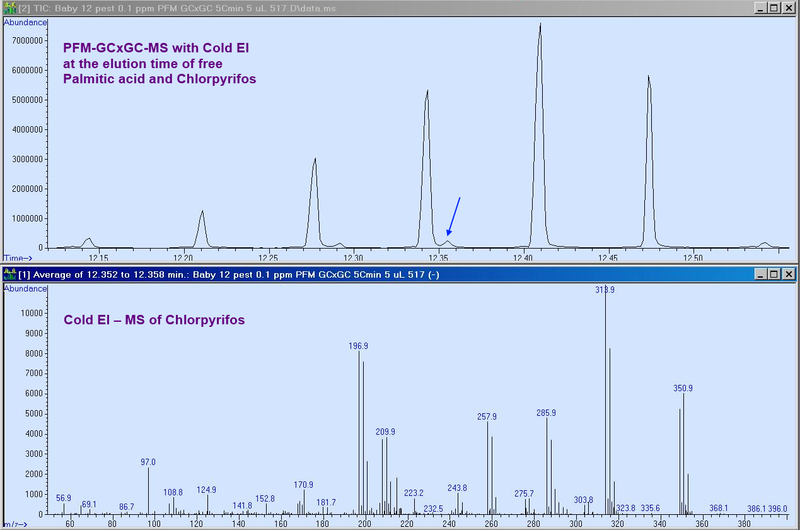 0.3 minutes sections of the total ion count mass chromatograms are shown in which 100 ppb Methidathion (in Baby leaves mixture extract) elutes below the indicating arrows at 11.94 min in standard EI and at 14.51 min in PFM-GCxGC-MS with Cold EI. 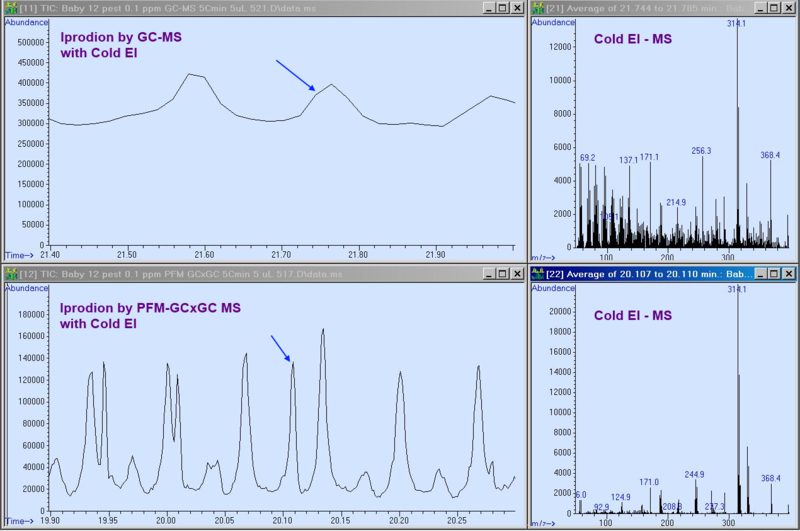 Note the vast improvement obtained in PFM GCxGC-MS with Cold EI in both peak to matrix background ratio and in the quality of mass spectra that are far cleaner with PFM-GCxGC-MS with Cold EI. The PFM TIC peak at 14.44 min is also of Methidathion in an earlier GCxGC cycle. Click image to enlarge. We found that with all the twelve pesticides (described in the table below) PFM-GCxGC-MS with Cold EI helped to significantly reduce the matrix interference in comparison with GC-MS with standard EI. The PFM improvement factors ranged from 3 up to 155 and the average PFM improvement factor is 36. This high magnitude of improvement needs an explanation about its origin. Clearly PFM GCxGC improves the GC separation hence reduce the matrix interference. However, the second dimension GCxGC cycle time is 4 s and average pesticide peak width is 250-300 µs and thus the expected improvement factor is about 14 and considering the fact that each pesticide and matrix compound span about two GCxGC cycles time means that the theoretically expected PFM improvement factor is only 7. This expected factor is also based on the assumption that the pesticides and matrix elution time in the second dimension is statistically (randomly) distributed. However, fortunately, pesticides are all semi-polar compounds while agricultural matrices are mostly non-polar or of little polarity and up to high polarity in free fatty acids. In Figure 4 we show the two dimensional plot of PFM-GCxGC-MS with Cold EI data of the 12 pesticides mixture spiked at 100 ppb in Baby leaves mixture extract (1g/ml). The pesticides elution times are indicated by their names and arrows to their elution peaks. As shown, the pesticides are all mid polarity hence are mostly in GCxGC elution times that are with relatively little matrix. Thus, while usually the second dimension elution times are not fully orthogonal to that of the first dimension column, in PFM-GCxGC-MS with Cold EI we encounter a rare case of "Super Orthogonality" meaning that the separation of the second dimension is better than expected based on its cycle time and average pesticide peak widths. Figure 4. A two dimensional plot of PFM-GCxGC-MS with Cold EI analysis data of 12 pesticides mixture spiked at 100 ppb in Baby leaves mixture extract (1g/ml). Click image to enlarge. It is emphasized that the large improvement obtained in the rejection of matrix interference is predominantly due to the improved GC separation of PFM-GCxGC-MS and not due to the Cold EI ion source features. Thus, we similarly encounterred significant PFM improvement factors in the comparison of PFM-GCxGC-MS with Cold EI with GC-MS with Cold EI. Figure 5 shows a comparison of pesticide analysis by GC-MS with Cold EI (upper trace) and PFM-GCxGC-MS with Cold EI (bottom trace). 0.4 minutes sections of the total ion count mass chromatograms are shown in which 100 ppb Iprodion (in Baby leaves mixture 1 g/ml extract) elutes at the indicating time arrows at 21.76 min in GC-MS with Cold EI and 21.11 min in PFM-GCxGC-MS with Cold EI. As demonstrated, significant improvement is obtained with PFM-GCxGC-MS with Cold EI in both peak to matrix background ratio and in the quality of Iprodion mass spectra that is far cleaner with PFM-GCxGC-MS with Cold EI. Figure 5. 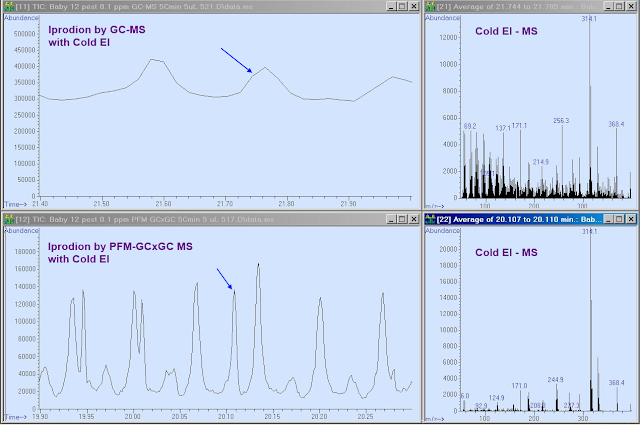 A comparison of pesticide analysis by GC-MS with Cold EI (upper trace) and PFM-GCxGC-MS with Cold EI (bottom trace). 0.4 minutes sections of the total ion count mass chromatograms are shown in which 100 ppb Iprodion (in Baby leaves mixture extract) elutes at the indicating time arrows at 21.76 min in GC-MS with Cold EI and 21.11 min in PFM-GCxGC-MS with Cold EI. Note the significant improvement obtained in PFM-GCxGC-MS with Cold EI in both peak to matrix background ratio and in the quality of mass spectra that is far cleaner with PFM-GCxGC-MS with Cold EI. Click image to enlarge. In Table 1 we summarize the PFM improvement factors in the analysis of 12 pesticides at 100 ppb concentration vs: a) GC-MS with standard EI with Baby leaves mixture matrix; b) GC-MS with Cold EI with Baby leaves mixture matrix; c) GC-MS with Cold EI with Lettuce matrix. As described in Table 1 the PFM improvement factors are high for all the three comparisons and they span the range of 3 up to over 100. The average PFM improvement factors are 36 versus standard GC-MS in Baby leaved mixture, 27 versus GC-MS with Cold EI in Baby leaves mixture and 33 versus GC-MS with Cold EI in Lettuce. As a result, the overall averaged PFM improvement factor is determined as 32. This average PFM improvement factor of 32 is considered by us as very high, higher even from the average matrix interference reduction factor of GC-MS-MS versus GC-MS which we estimate as 20. Furthermore, it is also much higher than the perception of average improvement factor in GCxGC-MS with TOF and standard EI. The reasons for the apparent superiority of PFM-GCxGC-MS with Cold EI over GCxGC-MS with thermal modulation TOF-MS and standard EI are: A) Cold EI excels in having ultra-fast ion source response time and no ion source peak tailing even for the most polar sample and/or matrix compounds and; B) PFM-GCxGC-MS is operated with 0.32 mm ID large diameter second column with high (20 ml/min) second column flow rate while thermal modulation GCxGC is typically operated with a micro bore 0.1 mm ID second column and with standard 1 ml/min flow rate. As a result, the sample capacity of the second column in PFM-GC-GC is higher by over two orders of magnitude than in thermal modulation. More importantly, while in thermal modulation the second dimension column is easily saturated and exhibits large peak fronting that hampers the GCxGC separation, in PFM-GCxGC the second column never exhibits second column saturation even if the first column is saturated by the matrix. Table 1. 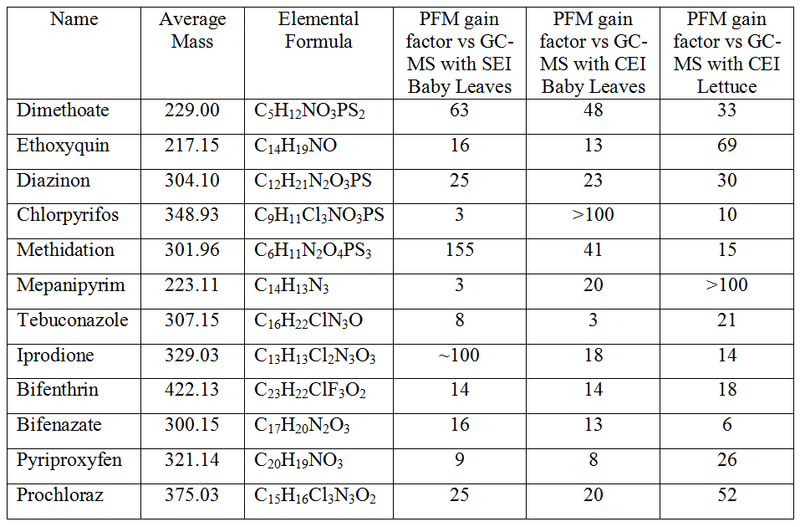 PFM-GCxGC-MS with Cold EI gain in reduced matrix interference (PFM Improvement Factors) in the analysis of 12 pesticides at 100 ppb concentration vs: a) GC-MS with Standard EI with Baby leaves mixture matrix; b) GC-MS with Cold EI with Baby leaves mixture matrix; c) GC-MS with Cold EI with Lettuce matrix. Click table to enlarge. Figure 6. A section of PFM-GCxGC-MS with Cold EI full scan mass chromatogram of 100 ppb pesticides in Baby leaves mixture extract. The mass chromatogram is zoomed at the 12.10-12.55 minutes elution time window. As shown, Chlorpyryfos (indicated by the blue arrow) is fully separated by the PFM-GCxGC from the much larger amount of free Palmitic acid (n-Hexadecanoic acid C16H32O2) that coeluted in the first dimension GC column and saturated it. As a result, high quality Cold EI-MS of Chlorpyrifos is shown at the bottom trace (after minor background subtraction) and it resulted in 97% NIST library identification probability. Click image to enlarge. An interesting example that demonstrates both advantages of PFM-GCxGC-MS with Cold EI over GCxGC-MS with standard EI is shown in Figure 6 that shows the case of full first column coelution of the matrix compound free Palmitic acid and the pesticide Chlorpyrifos. 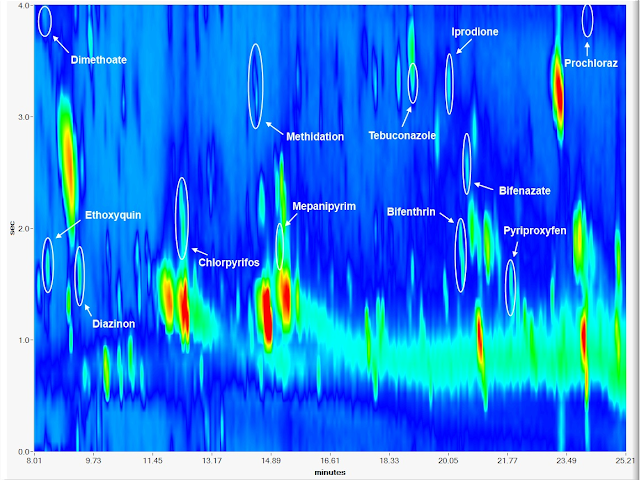 As demonstrated in Figure 6 Chlorpyrifos is almost fully separated by the PFM-GCxGC and as a result it provides a very clean and informative Cold EI mass spectrum for its effective identification and quantitation. However, the importance of Figure 6 is far greater than of a demonstration of a case of effective PFM-GC-GC separation. In Figure 6 we also demonstrate that: A) A very polar free fatty acid saturates the first dimension GC column that exhibits clear peak fronting while highly symmetric peaks of this matrix compound are exhibited in the second dimension GCxGC chromatograms. Thus, Figure 6 proves the claim that unlike in thermal modulation GCxGC in PFM-GCxGC the second column never saturates even if the first dimension column saturates and is fronting; B) Clean PFM-GCxGC-MS with Cold EI peaks are observed without any tailing for both the Chrlorpyrifos pesticides and for the highly polar free Palimitic fatty acid. This is in sharp contrast with any GC-MS with standard EI results in which free fatty acids require derivatization for their analysis. In Figure 7 we demonstrate the extreme peak tailing that can occur with polar matrix compounds inside the standard EI ion source. Figure 7 shows the 10-20 minutes elution time section of GC-MS with standard EI reconstructed mass chromatogram at m/z=256.1 of Baby leaves mixture extract. As shown, the free Palmitic acid eluted as a relatively small peak with very long peak tail of over ten minutes. Figure 7. A 10-20 minutes elution time section of GC-MS with standard EI reconstructed mass chromatogram at m/z=256.1 of Baby leaves mixture extract. As shown, the free Palmitic acid eluted as a relatively small peak with very long peak tail of over ten minutes. Click image to enlarge. Peak tailing hampers the effectiveness of GCxGC-MS with standard EI ion sources in the analysis of pesticides in agricultural matrices for two reasons: A) Polar pesticides can severely tail hence lose their added GCxGC separation and; B) Highly polar matrix compound such as free fatty acids can tail and impede the GCxGC-MS separation. As shown in Figure 6 PFMxGC-GC-MS with Cold EI does not suffer from any ion source peak tailing even for free fatty acids. Thus, the combination of absence of ion source peak tailing and second column peak fronting result in the high effectiveness of PFM-GCxGC-MS with Cold EI and in its high average PFM improvement factor of 32 in the analysis of pesticides in agricultural products. While the usual emphasis in pesticide analysis is on their quantitative determination their positive identification is also highly valuable as the impact of false negative and/or false positive identification of pesticides can be severe. In fact, false identification of pesticides in agricultural products can lead to major loss of money and food that is thrown away. Clearly NIST library identification is the best tool for pesticide identification. In comparison with MS-MS it also includes the step of exclusion of over 250,000 compounds in addition to the identification of the specific pesticide while in MS-MS the identification is based only on matching of the MS-MS peaks to the pesticide without excluding other possible compounds. However, the problem with library identification is that it is often severely impeded by matrix interference. 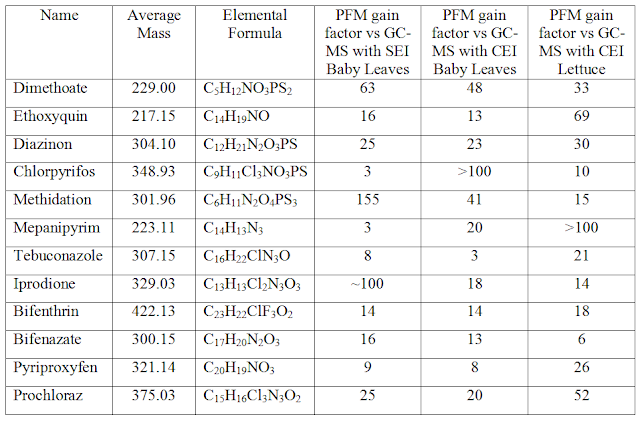 In Table 2 below we show that at the concentration level of 25 ppb none of the twelve pesticides were identified by the NIST library in Baby leaves mixture extract in GC-MS with standard EI (no background subtraction was attempted). In fact, only ten out of the twelve pesticides were included in our NIST 2005 library but we trust that newer versions of the NIST library include many more compounds and in any case pesticides that are not included can be added by the user to the library. In sharp contrast, in PFM-GCxGC-MS with Cold EI nine out of the ten pesticides that are in the NIST library where identifies and all of them were number one in the NIST hit list and with reasonable identification probabilities. Thus, the high PFM improvement factors manifest themselves also in highly improved NIST identification probabilities. Table 2. Pesticides identification at 25 ppb concentration in Baby leaves mixture extract. 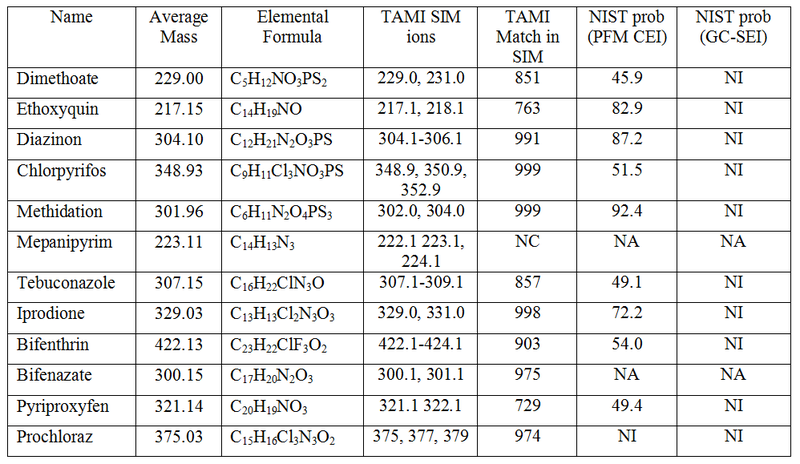 The table columns show: A) Column four shows the ions that were selected for identification in SIM mode by the Tal-Aviv Molecule Identifier software; B) Column five shows the obtained TAMI matching factors for the pesticides (0-1000 when 1000 denotes a perfect match); C) Column six shows the obtained NIST identification probabilities in full scan PFM-GCxGC-MS with Cold EI in the analysis of 12 pesticides at 25 ppb concentration in Baby leaves mixture and; D) Column seven shows the obtained NIST identification probabilities in full scan GC-MS with standard EI in the analysis of 12 pesticides at 25 ppb concentration in Baby leaves mixture. In the table, SEI means standard EI, CEI means Cold EI, NI is not identified, NA is not applicable such as not in the NIST library and NC is not confirmed meaning TAMI match below 700. Click table to enlarge. Once a pesticide was identifies its identification (and quantification) should be confirmed by an independent method. We developed a method and software for such independent identification which we named Tal-Aviv Molecule Identifier (TAMI). TAMI software operation is based on isotope abundance analysis (IAA). This software automatically confirms or rejects NIST library identification, and the combined use of two independent identification methods, the NIST library and TAMI based provision of elemental formula provides unambiguous identification. If NIST library fails (such as when the compound is not in the library) the TAMI software still provides elemental formula for identification, and the available EI-MS fragments provides additional structural information. However, effective use of the TAMI software requires good isotopomer ion ratios, which is often not available in the analysis of trace levels pesticides. Clearly the large PFM improvement factors are helpful in the reduction of possible matrix interference. Thus, our solution for the performance of independent pesticide confirmation identification was the analysis of time programmed few ions monitoring in which the SIM ions were two or three molecular ion isotopomers. The selected time programmed SIM ions are listed in Table 2 at its column four. As shown in Table two column 5, the identification of eleven out of the 12 pesticides were confirmed by the TAMI software with matching factors above 700 and nine with matching factors above 800. Accordingly, PFM-GCxGC-MS with Cold EI excels not only in improved identification of pesticides by the NIST library but also by the confirmation of the pesticide identification with the TAMI software which requires having sufficiently abundant molecular ions as provided by Cold EI. Pulsed Flow Modulation GCxGC-MS with Cold EI uniquely combines improved GCxGC separation with the superior MS selectivity and sample identification power of Cold EI. Furthermore, PFM-GCxGC is easier to construct, maintain and operate than thermal modulation GCxGC. An additional important advantage of PFM-GCxGC is that it is fully compatible with the scan speed of quadrupole mass analyzers in view of its ability to tune the second GC dimension injection time, while with Cold EI its increased ~20-30 ml/min flow rate is seamlessly handled without any use of open split that can lead to reduced sensitivity. As a result, PFM-GCxGC-MS with Cold EI can provide a superior combination of improved separation and identification at lower cost of goods compared to thermal modulation GCxGC combination with TOF-MS with standard EI. This article describes the application of PFM-GCxGC-MS with Cold EI for pesticides analysis in agricultural matrices. 12 pesticides were explored at the concentration levels of 100 ppb and 25 ppb in both Baby leaves mixture extract and in Lettuce extract. For improving the instrumental sensitivity we injected splitless 5 µL of extracts (5 mg commodity) and in order to keep the first dimension GC column in good condition backflush was applied at the end of each run. We note that backflush capability is inherently provided with PFM-GCxGC. Very high PFM improvement factors were obtained and the average matrix interference removal factor was 32. This large average PFM improvement factor implies that PFM-GCxGC-MS with Cold EI is as effective as GC-MS-MS in the removal of matrix interference. Furthermore, PFM-GCxGC-MS with Cold EI operates in the full scan mode and thus enables significantly improved pesticide identification by the NIST library combined with an independent pesticide identification confirmation. This confirmation is achieved via their molecular ions isotope ratios using time programmed two or three ions SIM and the Aviv Analytical TAMI software to obtain machine generated matching factors that serve for an independent pesticide identification confirmation. No ion source tailing and/or second column fronting. PFM-GCxGC-MS with Cold EI unlike GCxGC-MS with standard EI is characterized by the full elimination of any ion source peak tailing and/or by the absence of second GCxGC column saturation effects (peak fronting) that plague GCxGC-MS with standard EI. Enhanced molecular ions and its related improved selectivity. Cold EI provides enhanced molecular ions for further improved pesticide quantitation and suppression of matrix interference that is much lower on high mass ions. (as discussed in another article in this blog). Largely reduced matrix interference. PFM-GCxGC-MS with Cold EI provided average PFM improvement factor of 32 that is equivalent or better than the matrix interference reduction of MS-MS. Thus, PFM-GCxGC-MS with Cold EI can serve as an alternative to the widely used GC-MS-MS with similar effectiveness in matrix interference reduction. An alternative to GC-MS-MS. An important question is if PFM-GCxGC-MS with Cold EI is similar to but not better than the established GC-MS-MS in the removal of matrix interference, why it should serve as an alternative to GC-MS-MS. The answer to this question is simple, GC-MS-MS is a fully target oriented analysis method and any pesticide that is not included in its limited list of analyzed pesticides is prone to false negative identification. Accordingly, most of the pesticides are actually excluded from GC-MS-MS analysis and are simply ignored. We note that MS-MS can not be time programmed with full scan since it takes several seconds to remove the Q2 CID gas. Furthermore, MS-MS must include compound specific calibrations and its related large stock of pesticide sample solutions since its response is highly compound dependent as it depends on the relative abundance of the selected parent ion as well as on the efficiency of the CID in the provision of daughter ions which can significantly vary from pesticide to pesticide (and system to system). In addition, as the number of pesticides in the MS-MS list is growing, its instrumental sensitivity is reduced, and in a list of about 300 pesticides about 30 pesticides can be included in a single elution time window and lead into signal reduction at the same magnitude as in full scan in view of the fact that the signal is shared by 60 ions and suffer from about x10 signal losses in the MS-MS process. Universal pesticide analysis - The main goal. In contrast to GC-MS-MS, PFM-GCxGC-MS with Cold EI is operated in the full scan mode and thus its generated files can serve any time for post run data analysis of unlimited number of screened pesticides. This data analysis goal is achieved via reconstructed single or few ions monitoring (RSIM) on the pesticides molecular ions plus additional isotopomers or high mass fragments from an unlimited list of pesticides in predetermined elution time windows. It should be emphasized that Cold EI is characterized by uniform compound independent response in its total ion mass chromatogram peaks, the same as in standard EI but in standard EI unlike in Cold EI the uniform is eroded by ion source tailing for large and polar pesticides. Thus, while a selected group of few hundreds "important" pesticides (those that are selected for MS-MS) can be analyzed with calibration curves, all the other several hundred pesticides can be included in the list of RSIM analysis in given known elution time windows and listed molecular ions plus additional isotopomers or high mass fragments. The quantitative determination of these added pesticides can be performed even without the use of calibration pesticide solutions and it can be accurate within a factor of two via the TIC peak area or via RSIM on the molecular ion that is calibrated to the total ion peak. While the assumed accuracy this way is only a factor of two it is much better than to ignore the majority of all pesticides and have zero accuracy in their measurements. Once a new pesticide is consistently found it can be included in the list of the "important" pesticides for its higher accuracy analysis. Improved pesticides identification and confirmation. PFM-GCxGC-MS with Cold EI uniquely enables largely improved pesticide identification with the NIST library even at trace levels in complex matrices. Furthermore, it allows for the performance of independent pesticides identification confirmation via the measurement of their molecular ions isotopomers ratios and the generation of unbiased machine generated matching factors with the Aviv Analytical TAMI software. Extended range of pesticides amenable for analysis and the confirmation of LC-MS pesticides. The same PFM-GCxGC-MS with Cold EI system can uniquely also serve for the independent confirmation of LC-MS pesticides. It can be used for this purpose with high first column flow rate without the pulsing of the PFM that will only add in this mode a few ml/min flow rate to the second column. With 15 m first column length the injection flow rate can be over 25 ml/min and column flow rate can be 15 ml/min for achieving significant reduction in the elution temperatures of labile pesticides from both the injector into the column and from the column to the SMB. The use of a temperature programmable injector is preferred for this purpose. Any pesticide decomposition at the Cold EI fly through ion source ion is fully eliminated. In fact, even in this note the feature of extended range was proven via the analysis of free Palmitic acid and thus both labile and more polar pesticides that require LC-MS for their analysis can be confirmed with the PFM-GCxGC-MS with Cold EI system. EI and thus it can and should serve as a superior alternative to GC-MS-MS.
PFM-GCxGC is now offered for sale by Aviv Analytical for its combination with the Aviv Analytical 5975-SMB GC-MS with Cold EI. M. Poliak, M. Kochman and A. Amirav "Pulsed Flow Modulation Comprehensive Two Dimensional Gas Chromatography" J. Chromatogr. A. 1186, 189-195 (2008). M. Poliak, A. B. Fialkov and A. Amirav "Pulsed Flow Modulation Two-Dimensional Comprehensive Gas Chromatography Tandem Mass Spectrometry with Supersonic Molecular Beams" J. Chromatogr. A. 1210, 108-114 (2008). Aviv Amirav, "Pulsed Flow Modulation Gas Chromatography Mass Spectrometry with Supersonic Molecular Beams Method and Apparatus" Israel patent number 176724 (submitted in July 6, 2006) and USA patent number 7518103.